So I am apparently just very poor at this whole “keeping up with blogging” thing. I do try – I think about it often, I make a lot of plans – and then things fall through, or I get busy with something else, or my rampant perfectionism gets in the way and I convince myself I can’t do it the way I want, so why bother. In this case it was mostly a combination of the latter two. Two VERY BIG THINGS got in the way, and my rampant perfectionism was interfering with both miniatures and one of the big things. The excellent news is that one of those big things? Done and over. I FINALLY finished my master’s thesis, and I officially have an MA! So not only is this a VERY BIG THING that has really interrupted my life for the absolute amazingly better, it’s made mini-ing a bit difficult! First morning sickness, then exhaustion, and now a growing bump that makes it difficult to bend over and get close to things. So with all this, I’m a bit behind on my Creatin’ Contest build. As in, I kind of just started it. And if I manage to finish it in time, it’s also extremely unlikely I’ll be able to get my photos in due to the fact that the Little Jedi up there? She’s due to come out around December 24, only 8 days after the contest closes. Ha! So now with that crazy explanation over with, let me at least show you what I’ve been up to. On Tuesday, which I have now declared to be #powertooltuesday (pretty sweet, huh?) 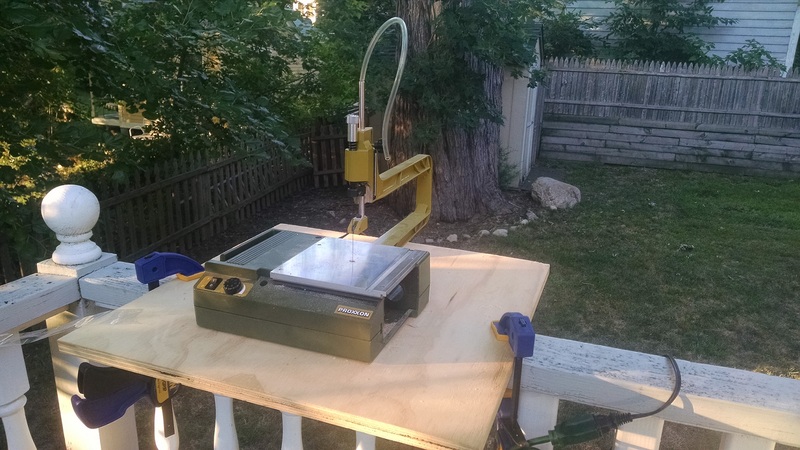 I hauled out my scroll saw to the deck. 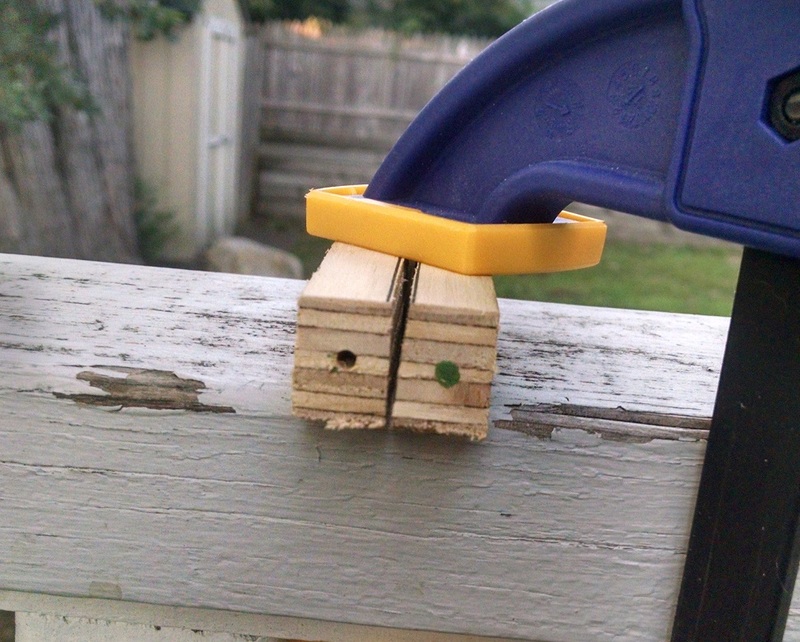 The deck railing is a pretty awesome place to clamp it to while I worked. The only limitation was that I was trying to do some straight cuts on some long boards to make some walls for the basement (we do have a circular saw, but remember the whole “Jedi isn’t a fan of loud noises”? Yeah) and the finials on the corners kept getting in the way. I made do. 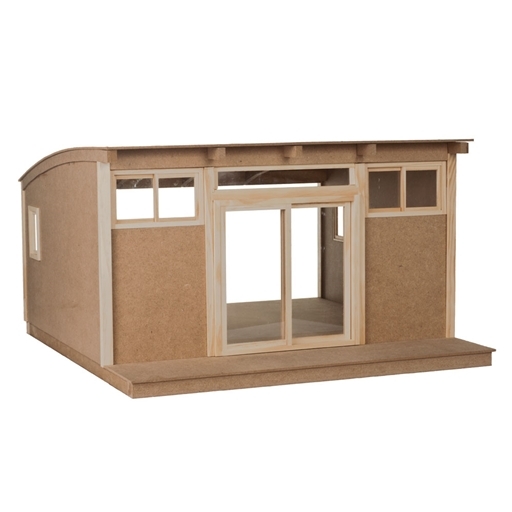 My lovely husband finally cut a nice board for me to mount the dollhouse to, for which I am grateful, particularly as the basement needs to be mounted first, of course! 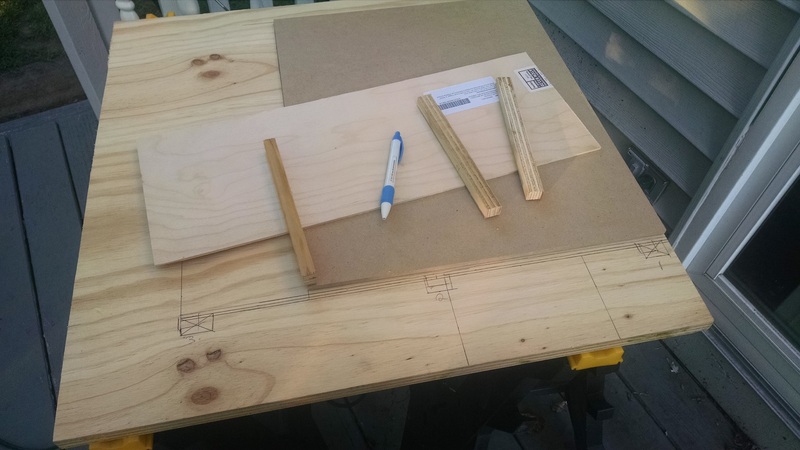 After cutting the walls, I took some scrap wood and also cut some supports. And that was the end of scroll saw for the day. On top you see the 3 supports ready to hold the wall they’re lying on in place. Underneath that wall is the floor from the City Cottage, which I used to position the walls in order to place the supports and ensure it was all going to work! 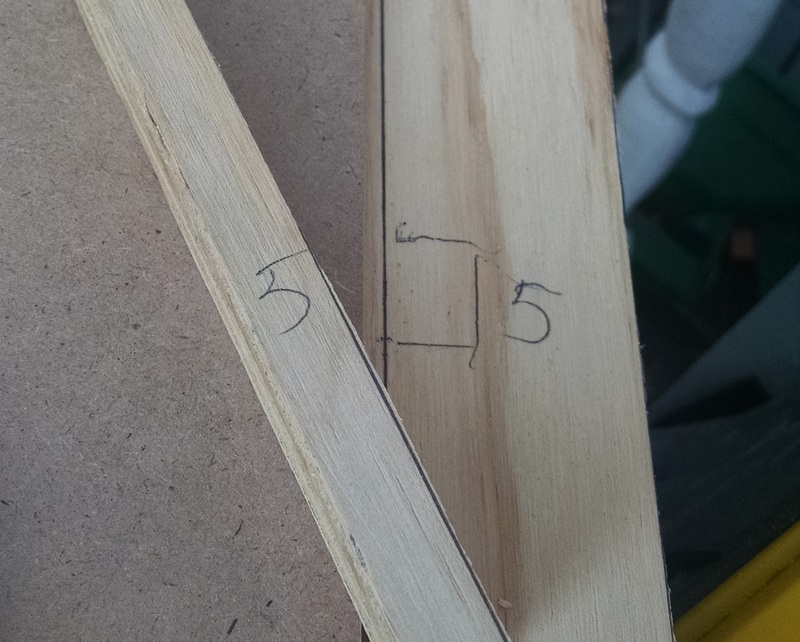 I traced around the bottom of each support, and numbered them since it was scrap wood and they were all sized slightly differently. 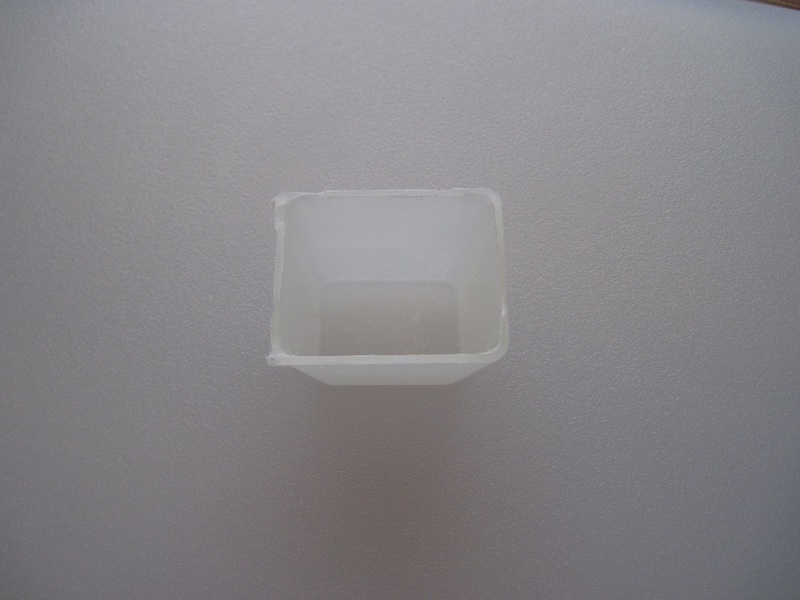 The numbering is especially important because of the next step: I grabbed some paint and put a small little dot of it right in the center (or close to) of the rectangle I’d traced around the support end. Then I took the support in question, and carefully placed it back into the traced square, so it absorbed the dot of paint. Why was this necessary? 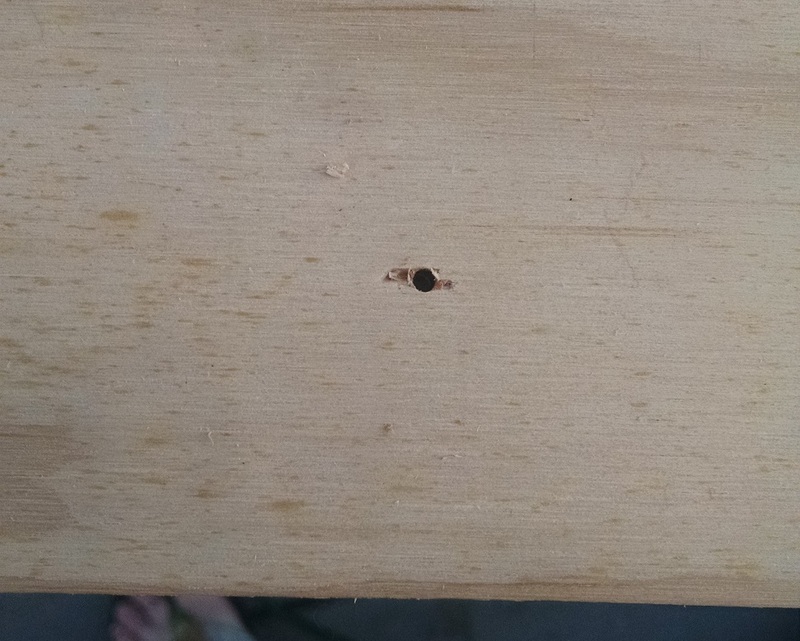 Because I planned to both glue and screw all of them in place for an extra-secure hold, and since I was dealing with scrap plywood, it was imperative that I drill some pilot holes. 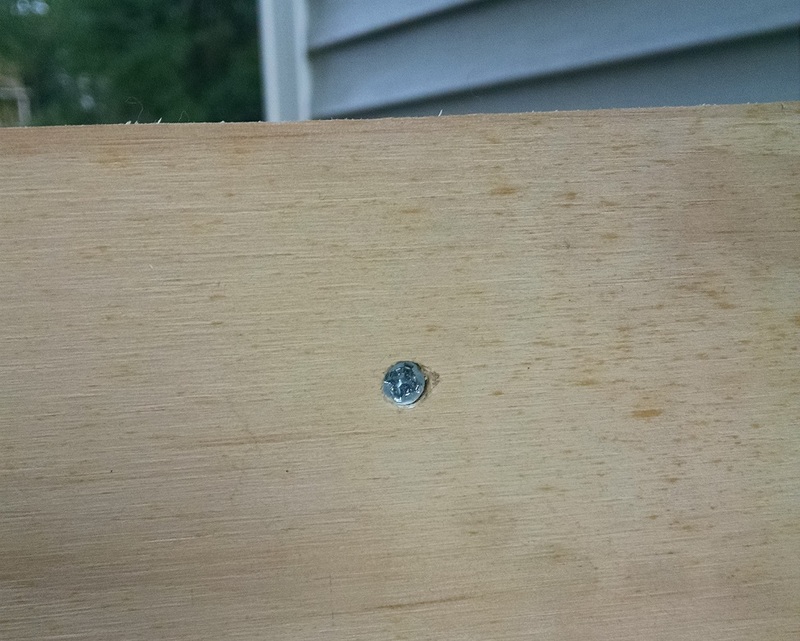 I clamped the supports to the deck wall, and drilled a pilot hole in each one, straight through the dot. 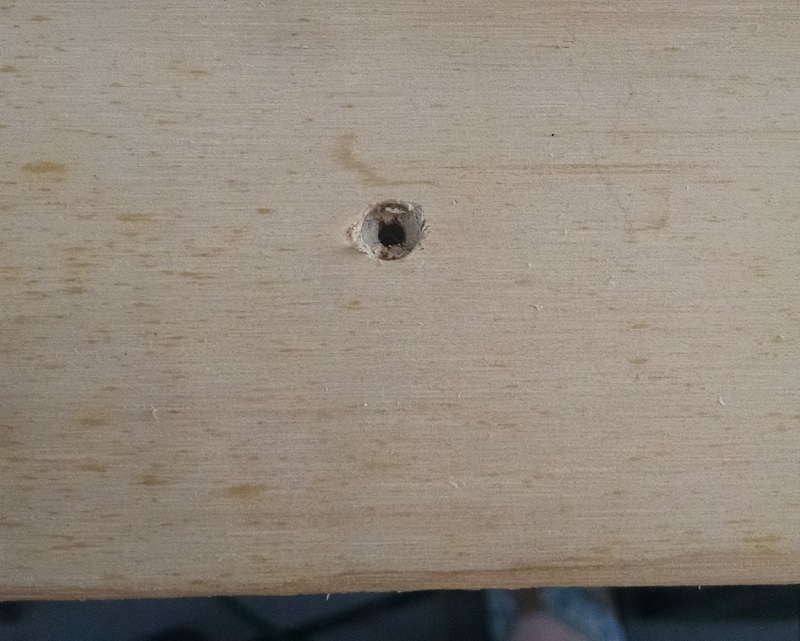 Next, I used the same paint points to drill holes in the base board – less important for splitting, but utterly crucial to knowing where on earth I needed to place the screws! 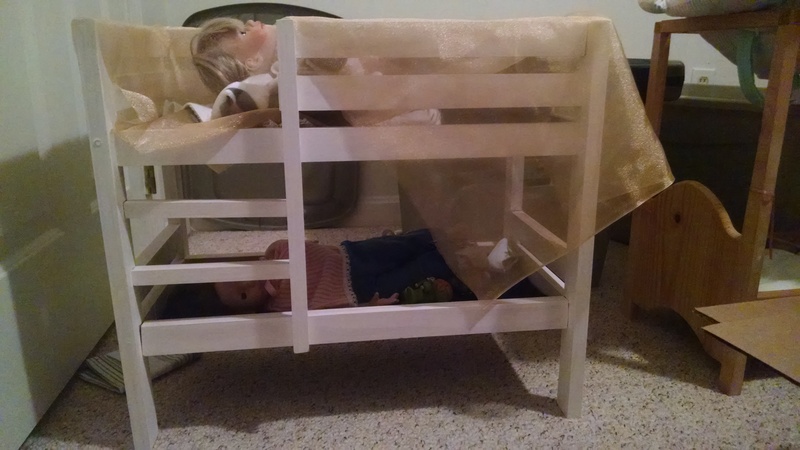 😉 Then I did a trick I figured out for myself back when I made the American Girl doll bunk beds – I took the largest drill bit I have, and made a very shallow hole over each of the pilot holes I’d drilled. 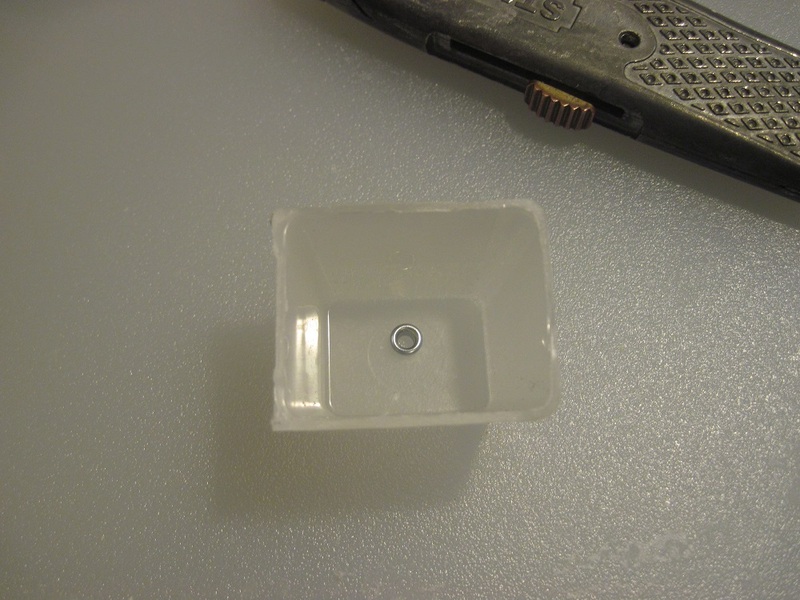 This is a brilliant technique that mimics what I’d have done with a sinkhole drill bit, something I don’t have – I can sink the screws well into the project, and not worry about them scratching any surfaces. 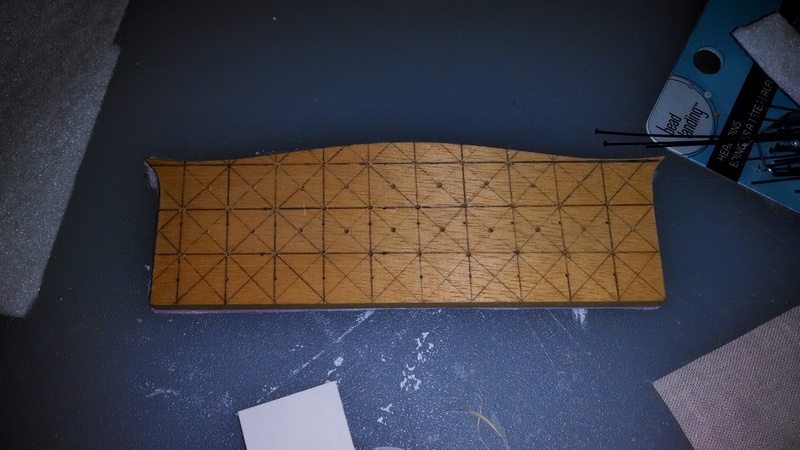 I completed that with all 5 supports, then glued & screwed each one into place. I ended by gluing the walls to the supports and clamping in place until they were dry (okay…mostly dry, I’m impatient and it had to come back inside overnight). I’ll be back with more about all of this next week! Everything is currently on hold while I move to a new home this weekend. Hopefully I’ll be back to miniatures soon. 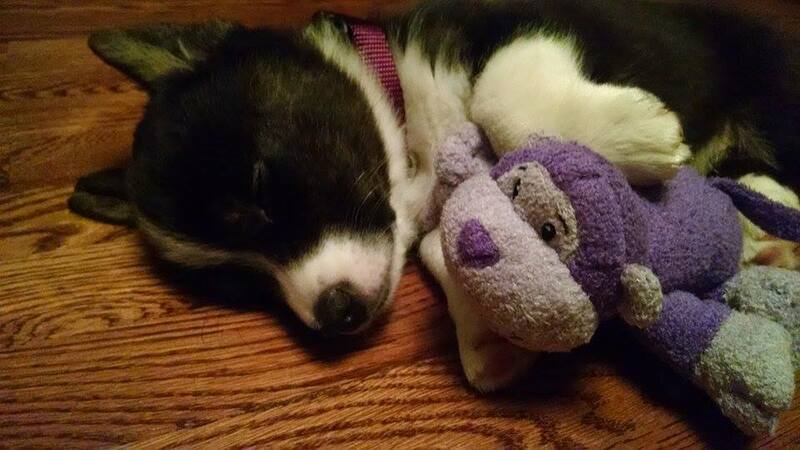 In the meantime, if you are willing and able, I would appreciate positive thoughts and prayers for my beloved dog. He suffered an accident yesterday and will be having surgery today to fix some internal bleeding and remove a mass from his liver. 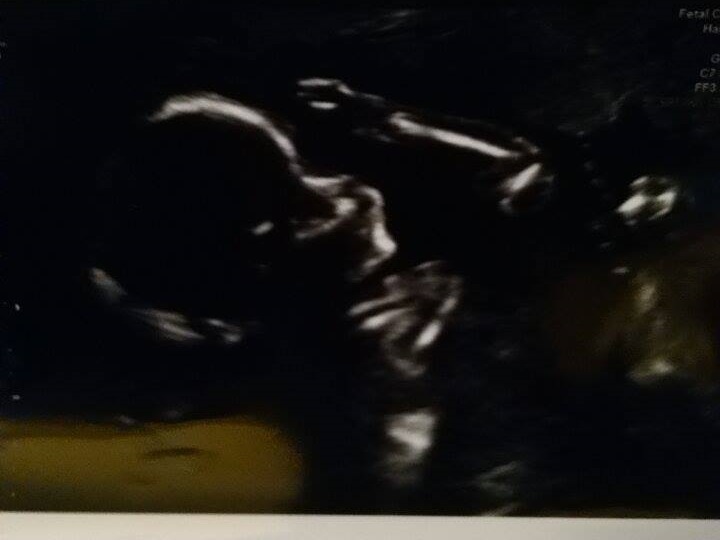 So far he is doing quite well, but that doesn’t make it any easier for us. I hope all of you, my wonderful readers here, are having a great start to your summers and finding plenty of time to mini away! Best wishes, and hope to be back here soon! 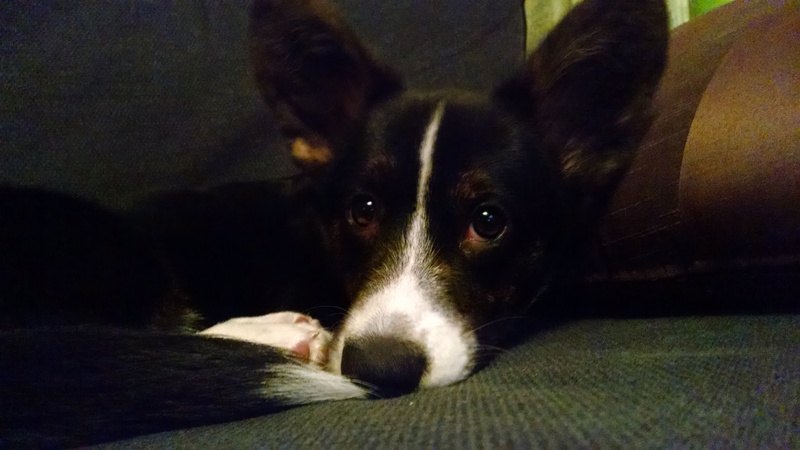 Update: I’m heartbroken to say my beloved puppyboo is no longer with us. Thank you for your prayers. We did everything we could possibly do, it was just a combination of many unfortunate factors which came together at once. I am very grateful he did not suffer today, and I am happy he will not be needlessly stressed by our move tomorrow. We will miss him greatly. It’s highly unlikely I’ll finish my Undersized Urbanite build at this point, sadly, but I am still plugging away and having a good time when I can. Right now I am still teaching, writing away at my thesis, and now we are moving in less than 2 months. Lots to do, and sadly minis don’t take mini amounts of time! Most recently I’ve been working on the sofa. I wanted it to be both grand and understated, or at least that’s the best way to describe it. I had a House of Miniatures Chippendale Sofa kit on hand, and decided to utilize it to make my visions come true. I’ve seen an awful lot of tutorials on Pinterest about making your own upholstered, tufted headboard, and I used many of the techniques here. I started by marking out lines on the back of the sofa, to create half-inch squares. 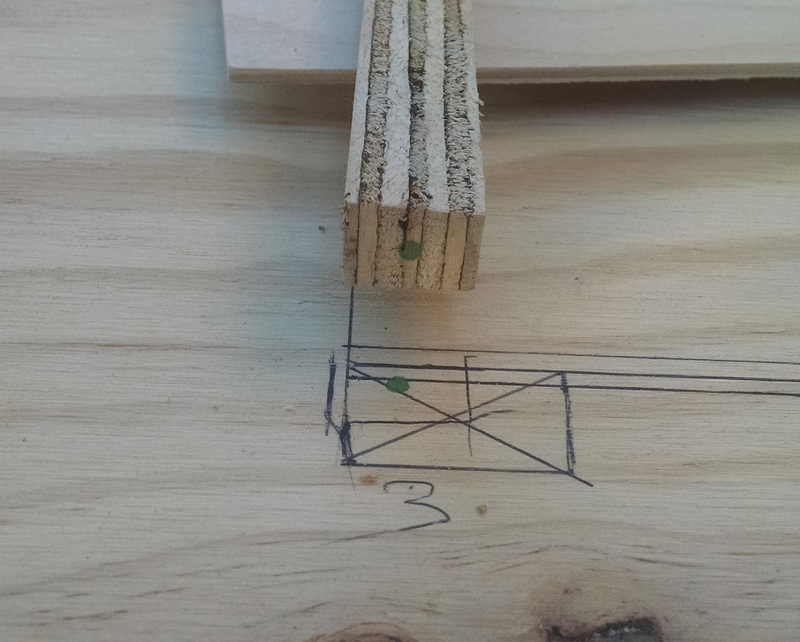 I then drew diagonal lines to find the middle of each square, and proceeded to use a pin vise to drill through the back. This helped me to create an offset pattern for each of the “buttons.” If I had truly thought it through, I would have begun with a centered line – sadly, I did not, but ultimately I don’t think it would have done a whole lot to change the finished product. The next step was to find the best way to cover the couch. 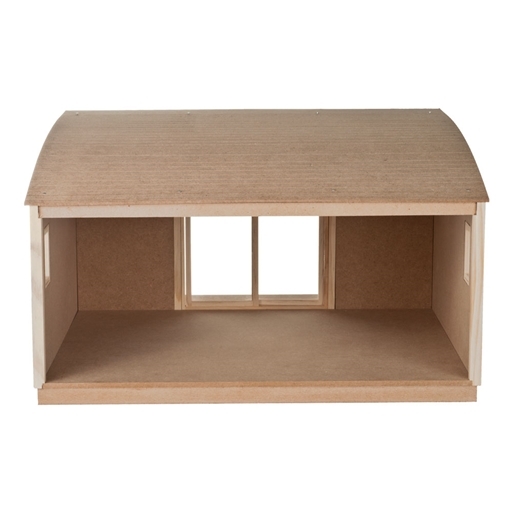 House of Miniatures kits are old, and while the foam included for the couch cushions was in good shape, I knew it is likely to dry out and disintegrate in the near-ish future. I ended up cutting new cushions out of pink craft foam, 2 layers. Unfortunately for me, the pink of the foam showed through the linen-esque fabric I chose, even after a layer of white felt. I ended up covering the bottom half with a scrap of fabric (seen above – you can see some of the pink through it!) 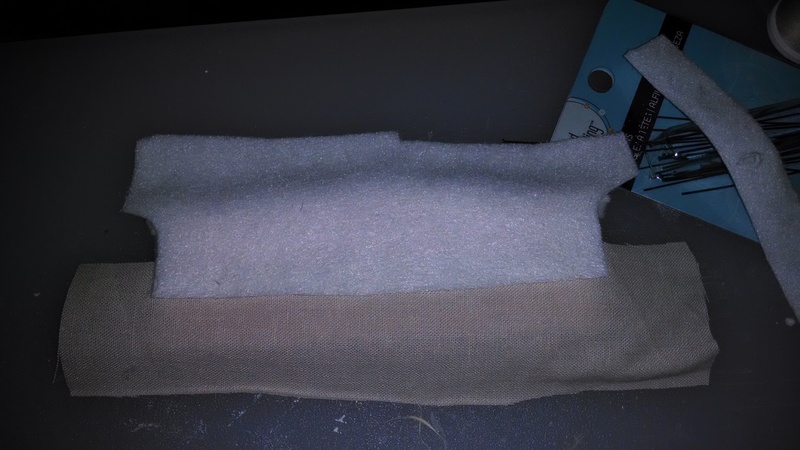 and the top half with another piece of felt to add a little extra fluff to the top part of the couch. 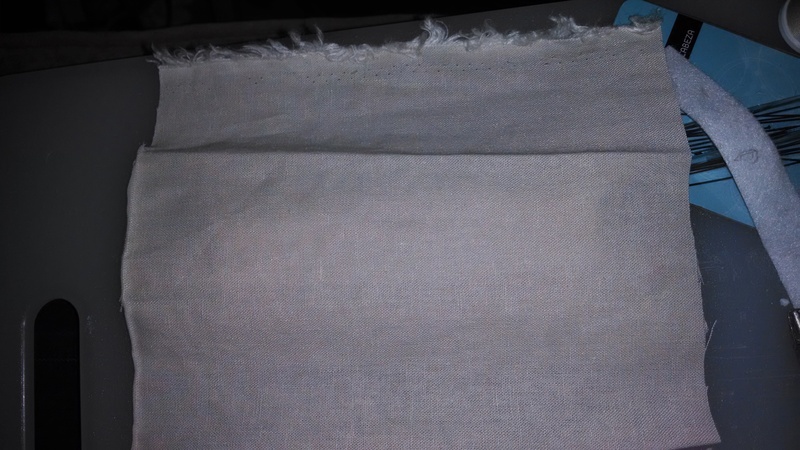 When it’s all covered with the larger piece of fabric, you can see it looks pretty uniform in color. 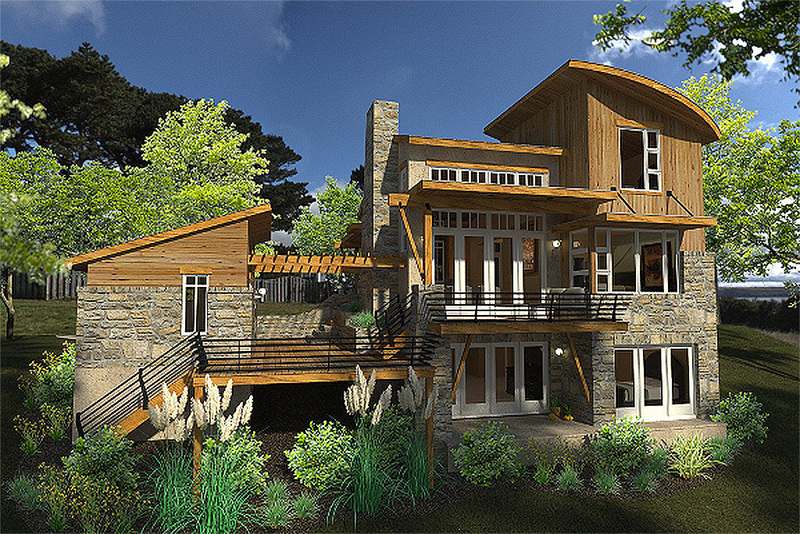 The next part was by far the most difficult part of the whole process – adding the tufts. 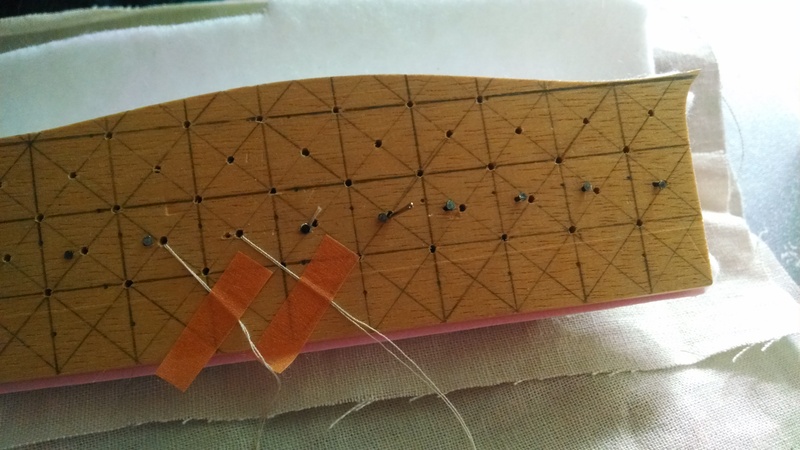 The holes were quite small, and finding a way to keep the threads pulled really tight was hard. 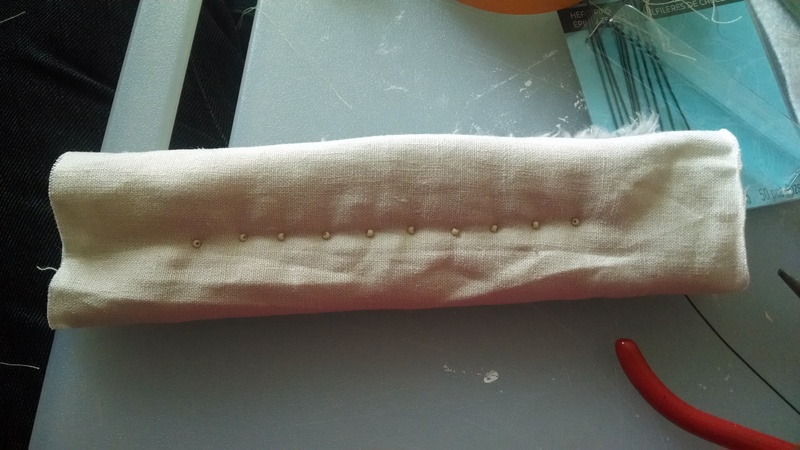 I ended up using two different methods – nails and bead crimps. The bead crimps were easier, but if I had to do it again I’d do nails all the way. More complicated, but it seems like a stronger hold. 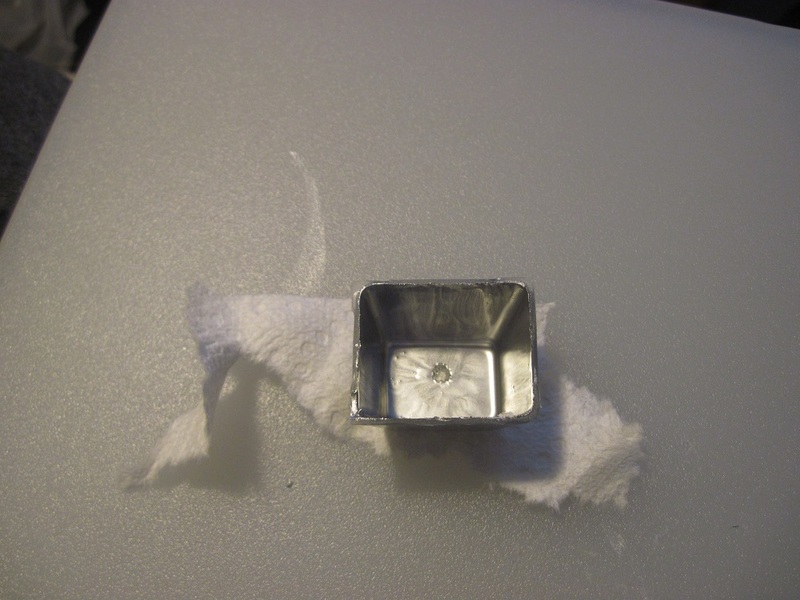 You can see the nails below – they are the tops of jewelry pins, cut off and carefully hammered in partway. 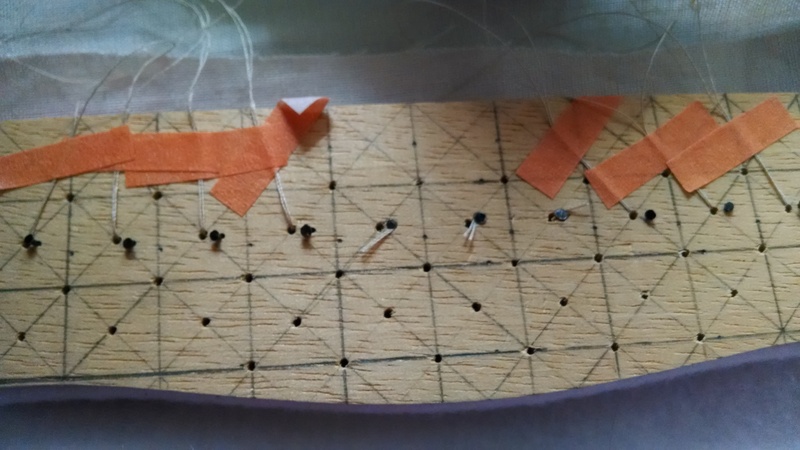 To get the thread through the holes, I first put a bead on the thread and put both ends of the thread through a long needle (Needle 1). 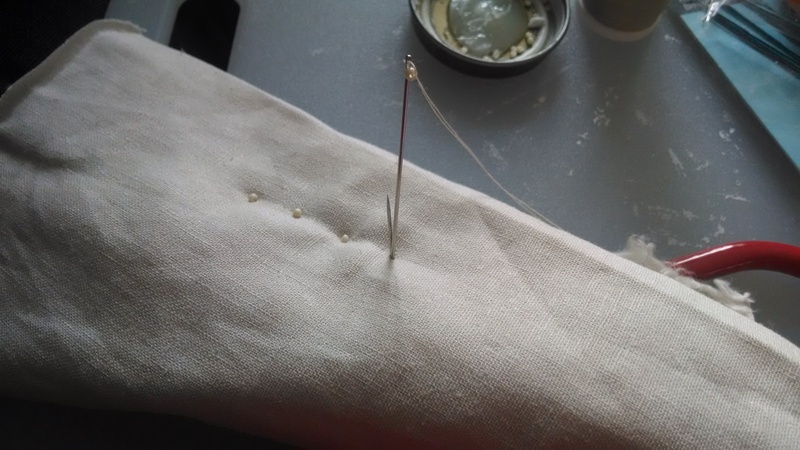 I then took a second needle (Needle 2) and pushed it through the hole from the back of the couch. Next, I took Needle 1 and pushed it through right next to Needle 2. Then Needle 2 was pulled out from behind, and Needle 1 was pushed all the way through until all thread had come out the back. I then taped the thread down so it wouldn’t accidentally be pulled out. 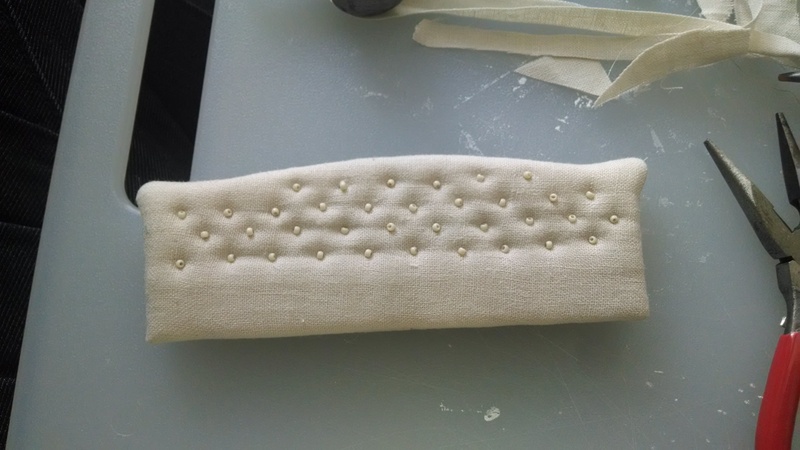 This took a little trial and error, as Needle 1 was not always in the correct position to just go straight through the pre-drilled hole, but it was by far the easiest way to get the needle through all layers of foam, batting, and fabric, in the right place! Once I had the full row done, I pulled the threads as tightly as I dared, wrapped them around a nail several times, and held the thread tight while I hammered the nail in fully. This is definitely the way I would recommend doing this if you try, and if I try tufting another piece I will do it this way again. It is complicated and can be frustrating, especially if you knock a nail out, but is far easier than the bead crimps. Had I known I’d use bead crimps, I definitely would have picked up sturdier thread. Occasionally the crimp would just cut right through the thread and I would have to completely re-do the tuft all together. I’ve also had a couple come loose since I finished, leading me to have to glue a couple of beads back on – definitely not ideal! This is the unfinished product – one row done! I did not bother tufting all the way down, because half of the back is hidden behind the back cushion. Instead, I started in the middle and worked my way up. The finished product! Before I attach this to the rest of the couch, I’ll take a needle and try to get all of the beads facing the same way. Until then, I think it looks pretty darn good! It has been far too long since I have been able to make a post about progress – sadly, not a whole lot of progress has been made. Since my semester ended in December, I’ve been working on my thesis a lot, but I have also been hired as a teaching fellow for a huge university, which is a very awesome step for me! 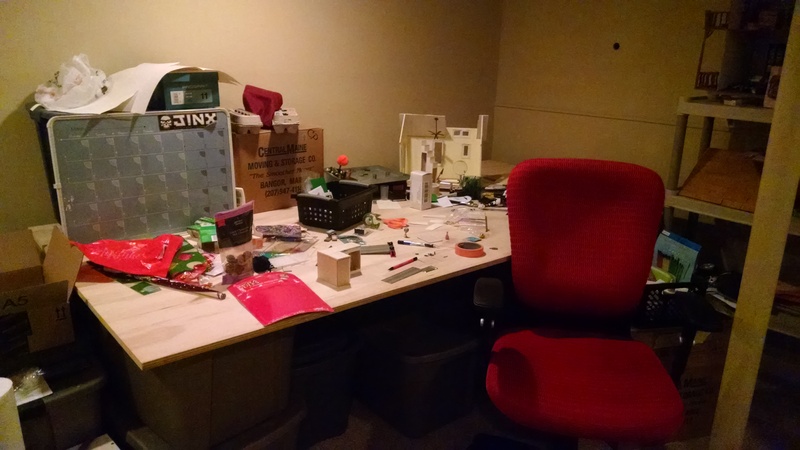 Unfortunately, it means less time for minis – but I’m trying! Above is the progress I’ve made on the kitchen. 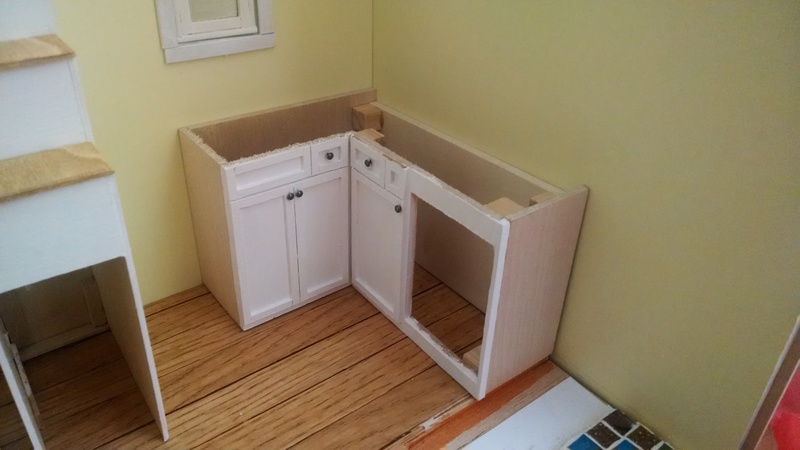 You can see a bit of the staircase as well – that will have a nice feature of some pull-out stairs 🙂 After struggling with options for the counter top for a while and really not being happy with any of my DIY options, I finally decided to contact ELF Miniatures about a custom worktop. Elizabeth at ELF has been incredibly amazing, and I’ve experienced some of the best customer service I’ve ever been given. I can’t wait to showcase the final result! The most work left at this point is finishing the kitchen, putting together the bathroom, and a few pieces of furniture. After that it will be decorating. I don’t know if I will be able to finish in time for the Undersized Urbanite, but I’ll certainly be trying!